Cotton balls on your maple? Or on elms, willows, or poplars? Look again. 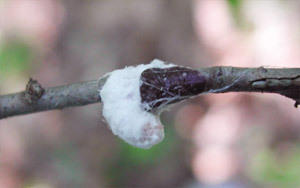 These are the egg sacs of a unique insect pest that is hard to control in adulthood. If physical removal doesn't suffice, a systemic plant insecticide is required.